SINCE the RWM 2018 exhibition at the NEC in September, there has been a series of non-stop tests at the Master Magnets’ Redditch-based technical laboratory. 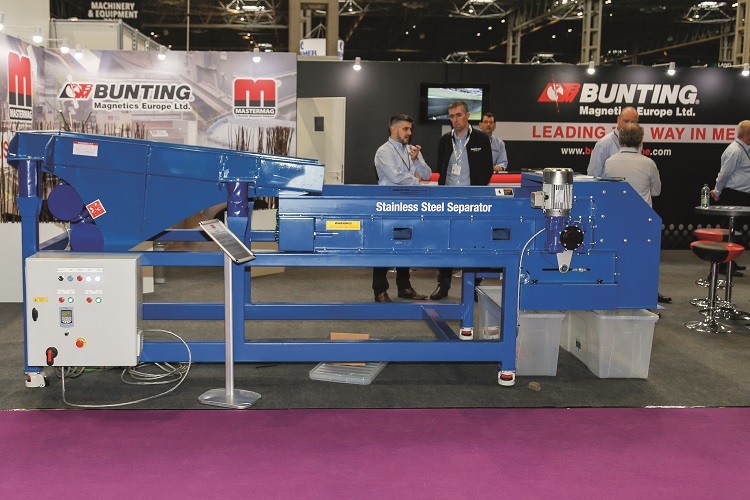 At RWM, the SSSC version of the Stainless Steel Magnetic Separator attracted the crowds, as the machine performed tireless demonstrations on a wide variety of mixed materials, which proved the innovative product’s separation capabilities. There are two stainless steel types that are regularly found in waste materials. First, there is a Ferritic stainless steel, which has a magnetic property. The second stainless-steel type is Austenitic stainless steel, which is non-magnetic in a pure form. However, when Austenitic stainless steel passes through a shredder it becomes weakly magnetic on the edges. Nevertheless, the magnetic force needed to impart enough attraction to separate the weakly magnetic metal is substantial. The Stainless Steel Magnetic Separator has an exceptionally powerful magnetic head pulley at the end of a conveyor. Material feeds evenly onto the belt via a vibratory feeder and then moves into the magnetic separation area. Magnetically susceptible materials become attracted and then separated from non-magnetic materials. In addition to stainless steel, the magnetic separator also recovers printed circuit boards. Presently, there are two models of the Stainless Steel Magnetic Separator. The High Intensity Separation Conveyor (HISC) separates smaller particles with a 4” or 6” diameter high intensity magnetic pulley. This design of separator is working successfully in operations to recycle plastic and electronics. The Stainless Steel Separation Conveyor (SSSC) recovers larger stainless steel (up to 5” frag). This model, with an 8” diameter high intensity magnetic pulley, is working in plants recycling white goods and electronics, and in automobile frag operations.